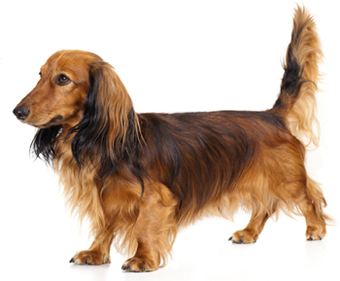 Learn about the temperament and personality of the Dachshund. Discover what he's like to live with, his traits and characteristics and how he generally behaves. And look at lots of Dachshund photos. 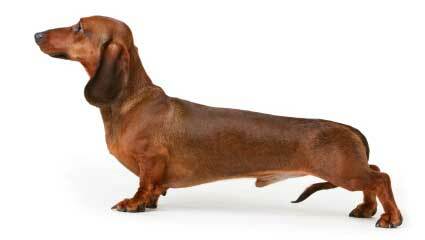 The Dachshund is fearless, brave, rash, playful, determined and clever. He's quite independent and stubborn because he was bred to hunt alone. He can be quite bossy and will take over the house if you let him. He's a "one-man" dog and bonds more closely with one individual in the family. He likes to be in on everything you do and he will follow you everywhere (never again will you go to the bathroom alone). He's playful and will chase a ball (but he probably won't bring it back). He can take a while to warm up to strangers and can be argumentative with other dogs. It's in his instinct to dig and burrow so you'll find him tunneled under blankets and pillows. He's affectionate and likes plenty or cuddles and belly rubs. He has a keen sense of smell and will wander off when he picks up an interesting scent so he should not be trusted off leash or unfenced. He can be a bit of a barker (and his bark is loud for such a small dog!). He has a high prey drive and will ferociously chase any small, fleeting creature (including a child). He's good with children who are gentle and respectful, but he may nip at a bratty child who teases him. He loves the company of other Dachshunds. 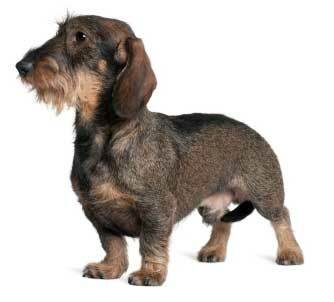 The Dachshund sheds a fair amount of hair. You'll find hair stuck to your couch, carpets, clothes and everything else in your home.